Welcome back to Day 4 of our Anni-VERVE-sary August Release Spotlight Hop! Today is the Retrospect Hop and Product Release! 3 die sets and a sequin mix just released and they're all available to order right now!!! focus is designer's choice, so you might just sneak a peek at a whole bunch of must-haves! If you hopped over here from Marisa's blog, then your in the right place! 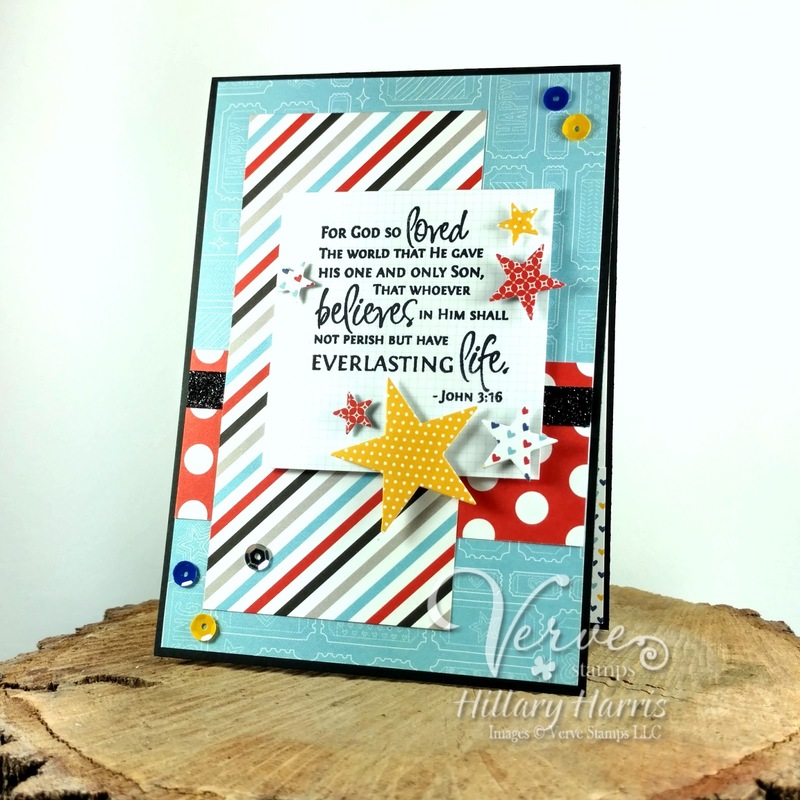 For this first card I used a verse from Scripture Medley 4 with my CTMH paper and ink and due cut the stars using Verve's Starry die. 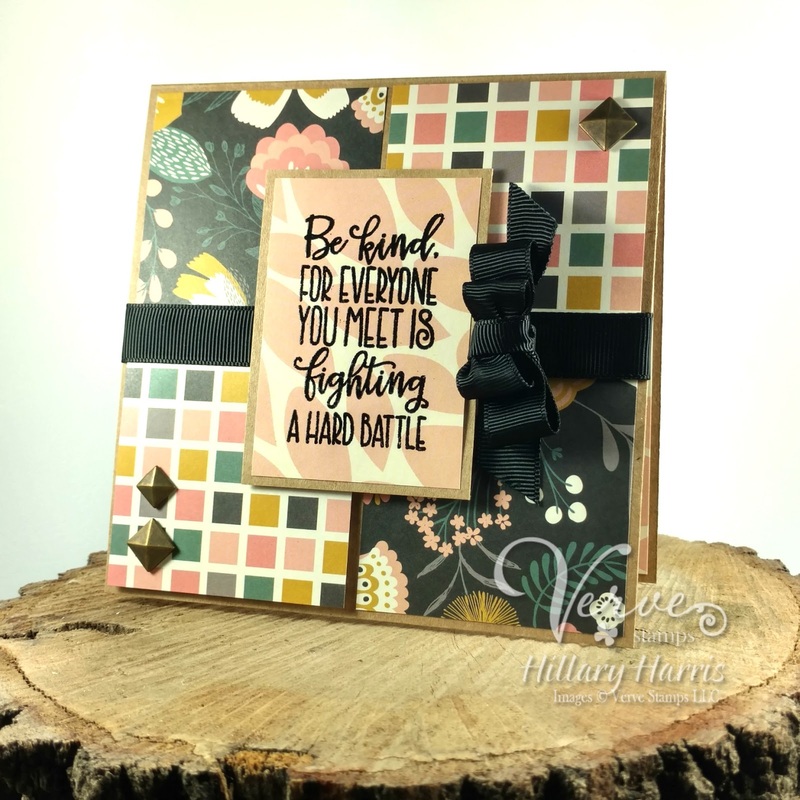 For my second card I used a wonderful quote from the Kindness Matters stamp set. I used a cute paper pack from Paper Studio and made a double loop black grosgrain bow with my Zutter bow-it-all. For my final card I used a wonderful verse from the Potter's Clay stamp set as well as the flower from that set and coordinating Pottery die set. I embossed my flowers in gold and watercolored them with my CTMH ink. I used a retired CTMH paper for this card. can check out the master list at the bottom of my post and start from the beginning! a random commenter on one of the hop spots below to win our ENTIRE new release! So be sure to leave a little comment on all the blogs below to increase your chances! I will also be sharing my cards over at Word Art Wednesday! Really gorgeous cards all week, Hillary! Love this trio of cards! The stars on your first card are really perfect for that verse. All three cards are very nicely done. 3 great cards making the sentiment the focus and all so different! Thanks for sharing your creative talents with us! Wow!!! I love them all so much in pinned them on Pinterest! LOL Amazing!!! All your cards are really beautiful!!! Just lovely, all of them. Love your cards. Such great scriptures in the new set! All three cards are fabulous, Hillary. Gorgeous cards! Love the sentiments in this release!!! Love the second with the squares. Wonderful cards. I like your choice of papers and colors. Beautiful cards. Thanks for sharing them with us. Beautiful cards! I really love those Verve sentiments. Beautiful cards...so hard to pick a favorite and I love the sentiments! You have been one busy crafter! I Love all of your gorgeous cards! What gorgeous cards, Hillary! I love them all! Wonderful, fun card! The sentiments in this release say it all, don't they?? A beautiful trio of "kindness" cards today. It was great to see your wonderful creations during this hop. You were on a roll! Lovely array of cards :) Wonderful to have you along as a GD this release. You made the sets shine! You've been a busy girl, love all your cards. Hillary, I love your interesting mix of papers used on your cards. Love your card designs along with a great selection of papers. Really fabulous and unique cards. Great cards! My fav is the first with the stars! Fantastic colors and patterns, beautiful verses! I love all the cards and I do agree with some above that the one with the stars is my favorite. Such great scriptures!! Such great sentiments and I love the papers you chose for each! What pretty cards. Thanks for the inspiration! Beautiful cards! I love all the different patterned papers! Love all your cards and the scripture verses. Love the layering and scriptures! Beautiful cards! Wow! You gave my pinterest button a workout! Well done. You have made some wonderful cards this week for us to see, I do hope you come back again. great cards...love your use of patterned paper with this new release. There is something to love---and to emulate ---- on every one of your cards. 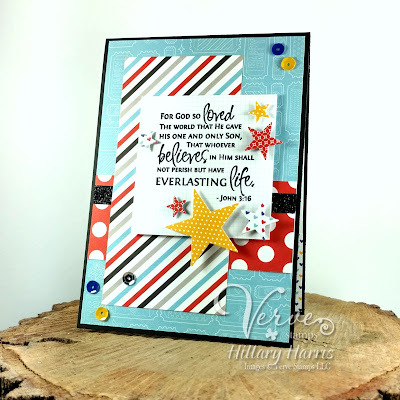 Love the bright stripes and bold stars, the patchwork pattern on the square card, and the all-over stamping on the third! Wonderful variety and all beautiful! Thanks for all your inspiration. I love all three cards and how you stamped the sentiments and the backgrounds and colors are perfect. Love the coloring of the flowers on your last card. Lovely. I love all the cards, but the last one touches my heart with that wonderful sentiment! What a set! I especially like the layout of the second and the colors of the third!! Fabulous cards for this release! Love each of them. Stunning cards! Love your great designs and this entire new release!!! I love all three of your uplifting and encouraging cards! Fabulous new products! Beautiful cards! I love when the focus is a Bible verse.